If one thing is true about Ava Raab, she’s certainly not shy. Sitting at a picnic table at the Tampa Bay Blueberry Festival, the vivacious 5-year-old munches on some chicken and recounts the amazing story of how she broke her arm over spring break. “She fell off the monkey bars,” her mother, Sandra, reveals. The family took to the festival to enjoy their Sunday. After all, they had plenty for which to rejoice: Ava had just been cleared of her cancer four days before. The energetic wannabe Tinkerbell never stopped buzzing around the table. And although she loves imitating her favorite feminine Disney princesses, make no mistake: Ava is all warrior. A seven-month battle with cancer couldn’t break her spirit. It was just a normal day when the Raabs went to the doctor to get Ava her flu shot. Sandra decided to get the preschooler’s five-year check up, as well, because she would be attending Bailey Elementary next year. Then, they received the news that changed their lives. The doctor detected a tumor on Ava’s kidney. That was on a Monday. Just four days later, she was in an operating room for surgery. Sandra told Ava and her brother, Andrew, that they could do whatever they wanted that day. They went for ice cream. 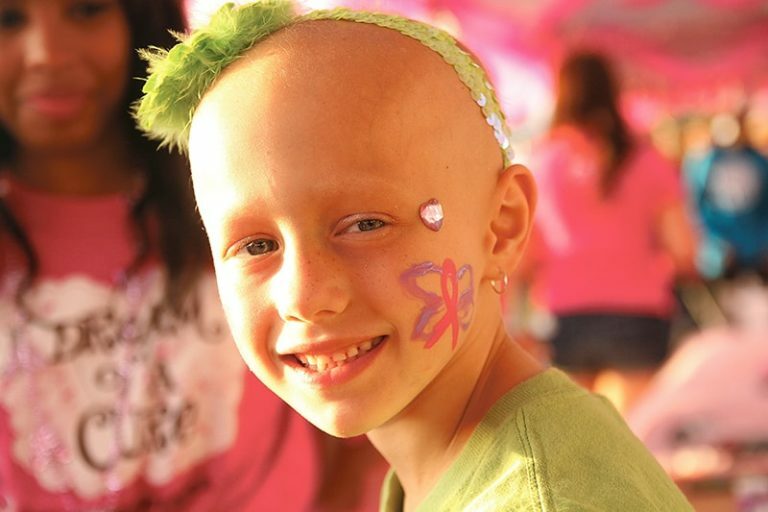 Ava had Wilms’ tumor, a rare kidney cancer that primarily affects children. Also known as nephroblastoma, Wilms’ tumor is the most common cancer of the kidneys in children and most often affects children ages 3 to 4 and becomes much less common after age 5. Sandra was understandably upset. But the doctor told her to focus on two words — cancer and cure. After Ava’s tumor and kidney were removed, she underwent a 28-week, 20-round chemotherapy treatment. The family went to Panera Bead Company every day after treatments. Now, she can’t stand soup. The two blond-haired, blue-eyed siblings seem to be inseparable, working in cahoots to convince their parents to get a sno-cone at the festival. They chatted at the table, trying to top each other’s stories. “I got poked in the eye by the pointy edge of a box,” Andrew says. Ava’s enthusiasm and energy likely helped her overcome her illness. But the team at Bailey Elementary was beside her the whole time. Sandra served on the PTA all through Ava’s battle. Through the meetings, teachers, students and even the principal, got to know Ava. She became the school’s ambassador for their Relay for Life team. “She showed the kids that cancer could happen to anyone — not just old people,” team captain Aviva Baker says. With the help of Ava, Bailey raised $5,850 and were in the top 10 fundraising teams at this year’s Relay. More than 20 students participated — all in support of Ava and the cure. “She’s just lively, fun and happy, all-around,” Baker says. “It was amazing, because she doesn’t even go there,” Sandra says, cutting a piece of blueberry shortcake. With just a couple more questions between her and a sno-cone, Ava put her dad’s baseball cap over her bald head and then slipped her headband over it. The celebration wasn’t ending with lunch. It would continue for the rest of the day. And for the rest of Ava’s life.